Caitlin O’Connell-Rodwell has been a regular at the same watering hole for more than 25 years. Most of the other patrons are elephants. 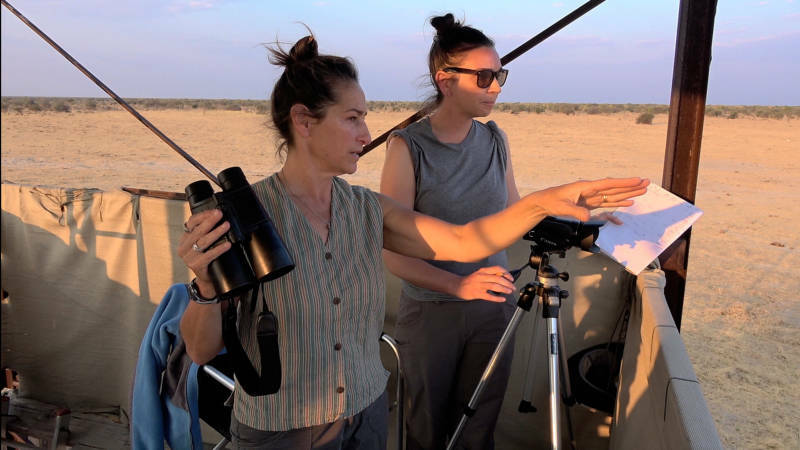 This summer marks the Stanford researcher’s 26th visit to Mushara, a natural freshwater spring in Namibia’s Etosha National Park that gets heavy elephant traffic. Thousands of elephants in the southwest African nation roam an area the size of New Jersey, with different groups taking turns at the park’s numerous watering holes. 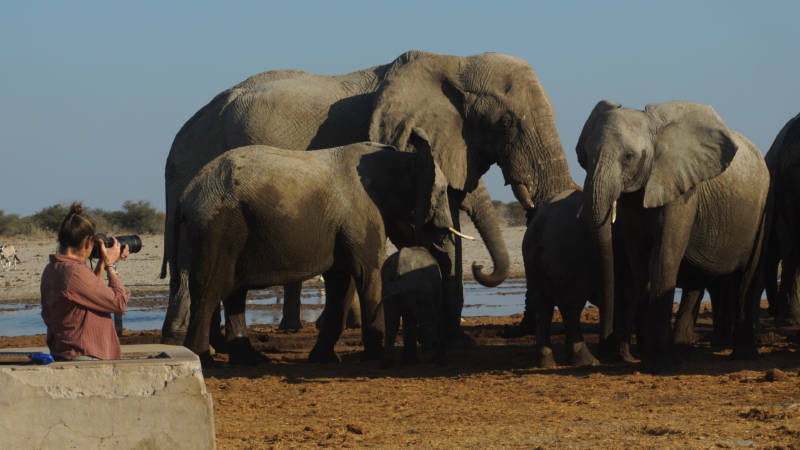 O’Connell-Rodwell’s research focuses on seismic communication among elephants, a field she pioneered back in 1997. Over the years, her work has shown that African elephants exchange information by emitting low-frequency sounds that travel dozens of miles under the ground on the savanna. The sound waves come from the animals’ huge vocal cords, and distant elephants “hear” the signals with their highly sensitive feet. “When an elephant vocalizes, it’s like a mini-explosion at the source,” said O’Connell-Rodwell. The sound waves spread out through the ground and air. By triangulating the two types of signals using both ears and feet, elephants can tune in to the direction, distance and content of a message. “It would be similar to counting the difference between thunder and lightning,” she said. According to O’Connell-Rodwell, seismic communication is the key to understanding the complex dynamics of elephant communities. There are seismic messages that are sent passively, such as when elephants eavesdrop on each other's footsteps. More active announcements include alarm cries, mating calls and navigation instructions to the herd. In a series of experiments first developed with the help of an elephant at the Oakland Zoo, O’Connell-Rodwell played typical calls on speakers buried in the ground to elephants at the watering hole at Mushara. She found that a predator alarm played on an above-ground speaker caused the herd to flee immediately. They responded quite differently, however, to the same call played underground. They closed ranks, but stayed put. She concluded that the elephants could tell the difference between nearby and distant dangers from how they had received the information. Another ongoing study looks at how young males -- who leave the herd for a solitary life in late adolescence -- sometimes come together into their own family-like groups. Like typical families, these male bands seem to communicate their movements over vast distances. O’Connell-Rodwell’s career studying seismic communication didn’t begin in these wide-open grasslands. As a master’s student at the University of Hawaii-Manoa she studied planthoppers, cicada-like insects that communicate with each other, chiefly for reproductive purposes, by sending out vibrations over the stems of plants. The leap from working with an insect that fits in your hand to studying the world’s largest land animal was an easy one. “It didn’t take me long to realize that they were behaving in exactly the same way,” she recalled. When she first observed elephants in Africa, she noticed how, like planthoppers, elephants adopted recognizable listening poses. Standing still, picking up a foot and pointing a toe at the ground were good indicators that new information was coming in. Seismic communication works with elephants because of the incredible sensitivity of their feet. Like all mammals, including humans, elephants have receptors called Pacinian corpuscles, or PCs, in their skin. PCs are hardwired to a part of the brain where touch signals are processed, called the somatosensory cortex. In elephants, PCs are clustered around the edge of the foot. When picking up a far-off signal, elephants sometimes press their feet into the ground, enlarging its surface by as much as 20 percent. In captivity, an elephant’s foot can become its Achilles heel. The pad on the underside of the foot grows about 3 inches a year. On the savanna, 18 hours a day of walking over rocks and dirt keeps it ground down and healthy, but most captive elephants have far less space to wander. “Walking and activities like digging are natural ways that wild elephants keep their nails and foot pads in good wear,” said Jackie Gai, a veterinarian at the Performing Animal Welfare Society (PAWS), a refuge in Calaveras County, California, that takes in elephants rescued from zoos, circuses and elsewhere. If the pad becomes overgrown, it can dry out, crack and get infected, just like a neglected callus on a human foot. In a 2006 survey by the Oregon Zoo, a third of North American zoos reported foot problems in at least one captive elephant. Most of these problems stemmed from too little exercise and too much time spent on the wrong surfaces -- namely, concrete -- according to the report. Biweekly pedicures are part of the routine for the eight elephants housed at the 2,300-acre PAWS facility. “One of our elephants with arthritis and crooked legs has her feet checked two to three times per week,” said Gai. Strictly speaking, when elephants pick up ground vibrations in their feet, it’s their sense of feeling, not hearing, at work. Typically, hearing happens without physical contact, when airborne vibrations hit the eardrum, causing the tiny bones of the inner ear to tremble and transmit a message to the brain along the auditory nerve. But even in humans, the two senses are not as distinct as they seem. “People with hearing impairment process vibrotactile [touch] signals in the auditory cortex,” O’Connell-Rodwell pointed out. Her work has shown that in elephants, some ground vibrations actually reach the hearing centers of the brain through a process called bone conduction. With bone conduction, the vibration message travels through the elephant’s skeleton directly to its inner ear bones, bypassing the eardrum altogether. 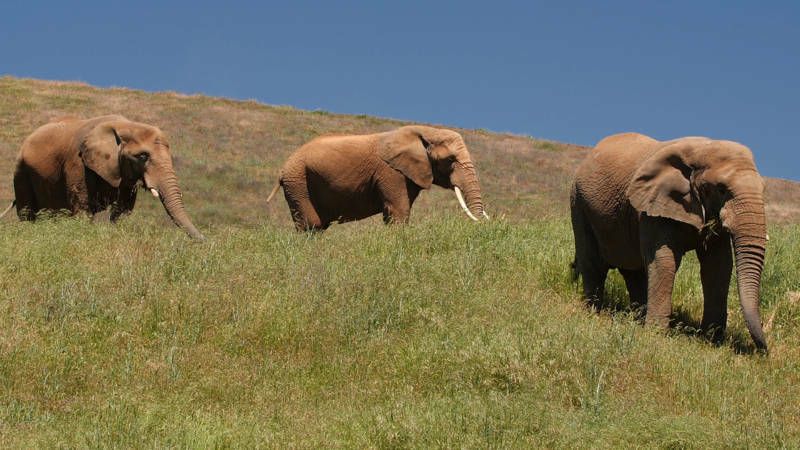 By modeling how the elephant’s inner ear bones respond to seismic sound waves, scientists are hoping to use a bone-conduction approach to develop new and better hearing aids for people. Instead of amplifying sound waves through the ear canal, these devices would transmit sound vibrations into a person’s jawbone or skull. Mostly likely, elephants use both to assess the information they receive vibrationally. “It’s very difficult to isolate one from the other,” O’Connell-Rodwell said.